It’s frighteningly close to Halloween and that can only mean one thing ... themed cocktails! 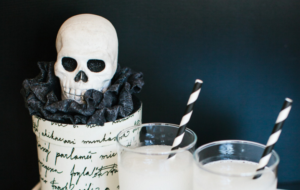 Grab your cauldron and get ready to brew these spooky, creative libations that will haunt your guests’ nightmares — er, at least it will get them pretty buzzed. We’ve ranked these recipes by difficulty and booze level (from 1-5), so you can pick and choose the right adult beverage for your ghoulish get-togethers. Pro tip: don’t forget to blast “Monster Mash” and Jimmy’s “Desperation Samba” on repeat while you shake and stir. Walker Blood Sangria [caption id="attachment_4597" align="alignnone" width="767"] Photo Credit: cf.cravingsofalunatic.com[/caption] Difficulty Level: Amateur Bar Goblin (1) Booze Level: Will Get You Twisted (2) This blood-red sangria is a little something to warm the insides before you take the kids out Trick-or-Treating. 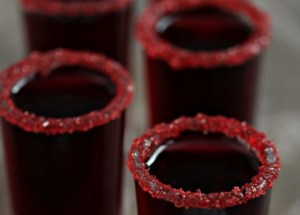 Merlot, Cointreau, and pomegranate juice lend the dark red hue, while a red sugar rim seals the deal. Try at your own risk. Morgue-A-Rita [caption id="attachment_4598" align="alignnone" width="765"] Photo Credit: hgtvhome.sndimg.com[/caption] Difficulty Level: Not Too Threatening (2) Booze Level: Medium Potion (3) Not your average Margaritaville marg’, this one has a scary twist! 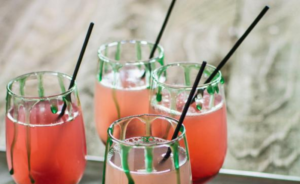 Dripping green food coloring down a wine glass and freezing to set adds a slime-tastic touch that will mesmerize your guests while they sip their yummy margaritas. Pina Ghouladas [caption id="attachment_4599" align="alignnone" width="771"] Photo Credit: Rennai Hoefer/DIY Network[/caption] Difficulty Level: Easier than Magic (3) Booze Level: You Will Probably See Ghosts TBH (4) For the feeling of lounging at a haunted beach, blend 4 ounces of pina colada mix, 1 ounce of coconut rum, and 1-1/2 cups ice, served with a black and white striped straw. A few of these may leave you and your friends in a cackling fog. 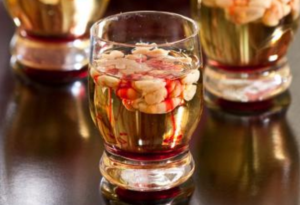 Bloody Brain Shooter [caption id="attachment_4600" align="alignnone" width="762"] Photo Credit: hgtvhome.sndimg.com[/caption] Difficulty Level: Evil Scientist (4) Booze Level: Hauntingly Strong if You Have a Few (4) Put science to creative use with this shooter, where the Bailey’s Irish cream curdles in lime juice and strawberry vodka to create brain-like strands. Shots, shots, shots! Shrunken Heads in Spiced Cider [caption id="attachment_4601" align="alignnone" width="764"] Photo Credit: 1.bp.blogspot.com[/caption] Difficulty Level: Expert Witch Mixologist (5) Booze Level: Eerily Light (1) or Virgin (0) Nothing pairs better with a Halloween costume party than a spiked cider with floating skulls. 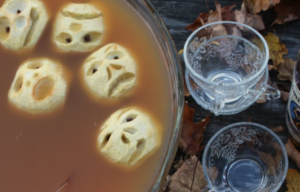 Your guests – or your kids, for a non-alcoholic version – will delight at having to ladle around creepy-looking shrunken heads to get their cider fix. While this drink can be mixed on the lighter side, we’re sure you know what to do to kick up the alcohol a notch.